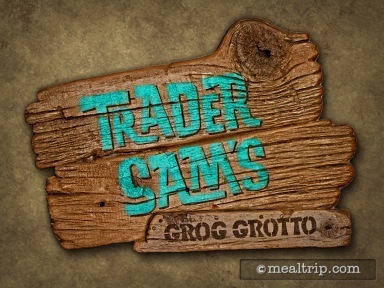 Tucked away in a back hallway on the ground level of the Polynesian is the entrance to Trader Sam’s Grog Grotto. The dark tiki bar is quite popular with those that like tiki bars. A small selection of Appetizers is available along with a much larger cocktail menu. Some of the specialty cocktails can be ordered in souvenir mugs and glasses. The room and the cast are "in-character" with whimsical tiki-themed schtick and all manner of trinkets and nicknacks adorning the walls, ceiling, and floors. The small lounge is very popular and can get crowded at times. Expect a small to lengthy wait just to get in the doors. If you’re just looking for the specialty cocktails and food that Trader Sam’s offers without the "show", check out the nearby "Tiki Terrace" outdoor lounge.